Lifetime's The Lottery Gives Us A Glimpse at the End of the World. Marley Shelton (Eleventh hour) stars as Dr. Alison Lennon, a scientist who has successfully fertilized human eggs in a laboratory. Nothing special about that, you're thinking? Except it's 2025 and women world-wide have mysteriously stopped having the ability to conceive and bare children threatening extinction of the human race. This is the premise of the new conspiracy thriller, "The Lottery", premiering on Lifetime July 20th. The world has gone into crisis mode attempting to find ways to restart reproduction and Dr. Lennon's experiment is the first sign of any new growth in 6 years. Dr. Lennon works for a government lab and once the discovery is made that she has managed to create viable embryos, she is immediately let go and shut out of her lab, which doesn't sit well with her. Meanwhile, Kyle, played by Michael Graziadei (Agents of S.H.I.E.L.D. ), managed to father one of the only naturally born children in the last six years and is raising the child as a single parent. When the Government steps in and tries to take his child, he removes his son from a hospital and runs. Where these two lives intertwine is Kyle's sperm was injected into one of the 100 eggs Dr. Lennon fertilized. Meanwhile, the United States Government decides to use these embryos as a symbol of hope, as well as for their own political gain and the White House chief of staff, Vanessa Keller played by Athena Karkanis (Low Winter Sun), suggests a Lottery to find women who will be impregnated with these embryos; hence the title of the show. I assume the series will follow the trials and tribulations of trying to find these lucky "human incubators" while certain forces will work to try and prevent any of this from happening. While I do think the characters will hint at what caused the infertility to begin with, I don't think the writers will tell us outright as that is part of the mystery and intrigue of the show. I do feel the writers were setting us up to create intertwining stories between the scientist, the father and the chief of staff; but after the first episode, I couldn't really tell you how they will all be interconnected and I'm not sure I plan on sticking around to find out. The Lottery combines drama, suspense, a glimpse into an alternate future, hope and a bit of "big brother is watching" to make for an interesting premise. However, I wonder if one episode isn't enough to really judge the success of this new series. I found the show to be a little boring and confusing. I wasn't always sure what day the characters were in or if they were in the same day at the same time (might make the show more interesting if they actually weren't –some parallel universe type of thing). I was not invested in any of these characters as of the first episode and didn't find myself "waiting" with anticipation to see what will happen next. I felt it had a solid beginning and could potentially grow into something unique and interesting, but I don't see it as of yet. 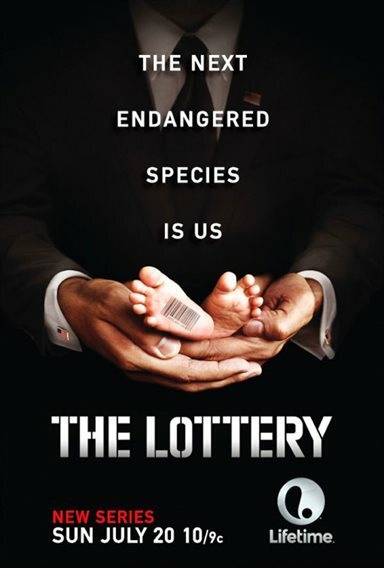 The Lottery preimers Sunday, July 20th, 2014 on Lifetime. For more information about The Lottery visit the FlickDirect Movie Database.